Doesn’t something about that just scream Scorsese? The obvious comparisons are there in the smokiness, the coloring, the detail in the clothing and the food on the tables. The neon sign in the window. 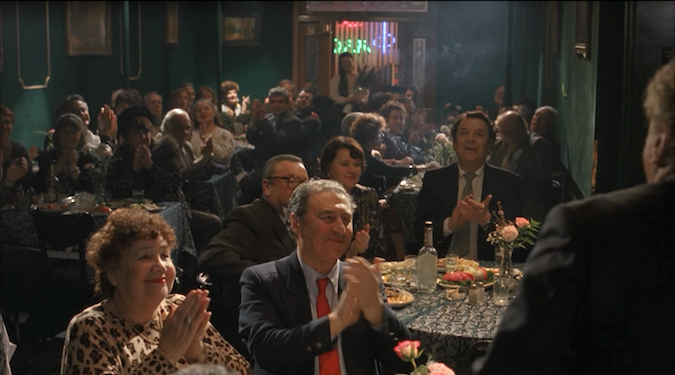 But the staging and perspective, too, seem to recall Scorsese’s camera. This is one of the more straightforward examples of such influence on the young James Gray, but the point isn’t to highlight how Gray made Little Odessa on the foundations laid by guys like Scorsese – he didn’t, and it’s clear even in this debut feature (made when Gray was just twenty-five) that his style is a distinct one largely free of ties to any cinematic giants of note. And the point isn’t even to prove that James Gray is deserving of a prominent rank amongst New York directors like Scorsese, although he is. The point, for now, is that Gray crafted Little Odessa as a New York movie, crafted it with that New York feel, and he did so for a very specific reason.